After some unfortunate circumstances, we have put our puppy raising hat on the shelf. We thoroughly enjoyed our time with Autism dog Services, but it is now time to move on. For the past month and a bit Huib and I have been trying to decide on what breed of dog we wanted to introduce into our family. We looked at getting a Bernese mountain dog, but due to timing, decided to wait a year or two. While surfing on the internet, I decided to look on the website of Rambling Goldens to see if they had any puppies coming from Smooches, the niece of our Aspen. Unfortunately she has been retired from their breeding stalk, but when I looked on their young adults available page I saw a puppy who interested me. When Huib got home that evening I showed him the pictures and profile. He asked me if it was still available and that question began our journey to bringing home Canyon (formerly sparky). 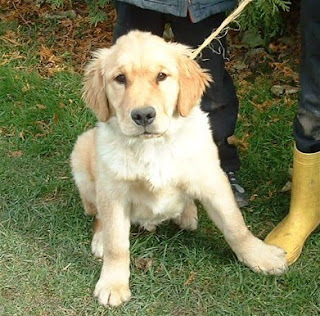 Canyon is a 6 ½ month old male golden retriever. He is (coincidentally) Aspen’s nephew – his mom, Goldie, is her half sister. He is 60lbs and already physically bigger than both Cessna and Aspen. His coat is thick and very fluffy – Aspen’s is not even close to as thick. He has not begun to feather, so it will be interesting to see how he looks in 6 months to a year’s time. His coat is similar to aspen in colour, except that his does not have as much white and hers has a little more red to it. He is gentle and sweet, but being a puppy he is also a big goof. He does not yet know his name, but he did not seem to respond to Sparky so we decided that changing it wouldn’t be a big problem. We got the name Canyon from a list of cities in Texas. We now have Phoenix (Arizona), aspen (Colorado) and Canyon (Texas). The name Cessna does not really fit into our naming theme, but I’m sure Cessnas fly to each of those cities so it works  In order to teach him his name, we are practicing recall as much as possible. Canyon has now been with us for 4 days and seems to be settling into our pack. Both Aspen and Cessna will play with him outside and Phoenix no longer gives him warning barks when he comes too close. he was not used to living in a house, but in such a short period of time he has already figured it all out. There has only been one accident inside and he is starting to pace less. Today he has actually been lying beside me longer than he has paced around the house. Our cats aren’t a huge fan, but I’m sure they will get used to him soon. They are never a big fan of a new dog coming into the house. Before closing this post, a quick update on Reece. He is still waiting to be adopted, but the surgeon has decided that even though he is a good candidate for the corrective surgery, he probably won’t benefit much at this time. He is currently staying with a family in Kitchener, but hopefully soon he will find his forever home. I will post a picture or two of him when I get them.